Wheel of Evil is the first of what I hope will be many adventure modules for Labyrinth Lord from Faster Monkey Games. 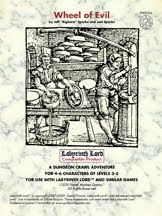 Written by Jeff and Joel Sparks, this 16-page PDF product (with 2 pages of nicely drawn maps and 4 pages of handouts for players and the referee) is intended to challenge a party of 4-6 characters of levels 3-5, although helpful guidelines are provided for using the adventure with weaker or lower-level parties. The PDF is attractively laid out, using two columns of text with clear headers and, where necessary, bullet points to draw attention to particular details. Art is sparse and (unless I'm mistaken) drawn from public domain sources, but, truthfully, the module is so easy on the eyes that I barely noticed the relative paucity of illustrations. The text itself is engagingly written, neither vapid nor overwrought, with dashes of Gygaxian flair that nevertheless avoid detracting from its overall clarity -- quite an achievement, in my opinion. Wheel of Evil takes place in and around the town of Renneton, renowned for its fine cheeses, which are aged in caves in the nearby Sardo Hills. Unfortunately, just weeks before the cheese festival that brings Renneton much of its annual income, the cheese caves were attacked by a band of kobolds, who seemed intent on destroying the cheeses for reasons unknown. The townsfolk fought back, slaying some of their number, and forcing others deeper into the caves. Certain townsfolk disappeared and they are assumed slain or captured by the kobolds who remain alive. The PCs are hired to investigate deeper into the caves, protecting the remaining cheeses, seeking out any Renneton survivors, and dealing with the marauding kobolds. The town is presently cash-poor and can pay the characters only in shares of the cheese harvest, thereby giving them a good reason to "behave responsibly" while venturing into the caves, as their bottom line is adversely affected if they destroy or allow to be destroyed too many of the cheeses aging within. In several places, the text specifically notes what actions might damage or destroy nearby cheeses and an accounting of these accidents will indeed decrease the reward the PCs earn at the adventure's completion. Without spoiling the adventure, I will only say that -- of course -- things are not as they first appear and there's a danger far worse than mere kobolds lurking within the cheese caves. This turn of events is, I think, very well handled in Wheel of Evil, following a naturalistic logic that lays the groundwork for a terrific little adventure -- and an unexpected one at that. Wheel of Evil is in fact a good model for referees looking to create meaningful episodic adventures that avoid the twin dangers of Just Another Dungeon and an epic quest to save the world. Wheel of Evil is both challenging and fun and it's full of clever inventiveness. It's one of the first adventures I've read since Death Frost Doom that made me consider ways I could include it in my Dwimmermount campaign in its entirety rather than as idea fodder. Even if I cannot do so, Wheel of Evil also includes a new spell and six new monsters I have a good mind to swipe. My only substantive complaint is the price. At $6.00 for the PDF, it seems slightly expensive to (apparently parsimonious) tastes, but I must concede that, given its quality, it bothers me less than it usually might. Wheel of Evil is an excellent adventure module and easily adaptable to most old school fantasy games and settings without much effort. As I stated at the beginning of this review, I hope we see more such products from Faster Monkey Games in the future, if Wheel of Evil is any indication of what's to come. Buy This If: You're looking for a quirky, cleverly written module to challenge characters of levels 3-5. Don't Buy This If: You're not interested in very modular adventures or have no need of adventures in this level range. "there's a danger far worse than mere kobolds lurking within the cheese caves"
I was sold on this as soon as I learned it revolved around an area called "the cheese caves". Oh yes. The setting of Wheel of Evil is a wonderful thing -- quirky without being silly and perfectly in keeping with Gygaxian naturalist principles. It's a very nice piece of work. Is $6 really too much for a 16 page PDF? Can't get lunch in these parts for that, and let's not even start on the price of a movie. Granted, if it is just idea fodder, you might pass, but for a playable module it sounds like a bargain. I personally find $6 expensive when you consider that the LL rules themselves only go for $4.95 in PDF form. That said, I'm often willing to pay slightly more for things I think are well done and useful and Wheel of Evil certainly qualifies. It's an excellent adventure and very cleverly done. I remember once facing (in AD&D2 I think this was) a being from the Quasi-Elemental Plane of Cheese. Of course, what something is "worth" is entirely subjective, and open to interpretation on an individual basis. Some people think that a rare bottle of wine is worth hundreds of dollars, others are happy with Two Buck Chuck. Comparatively speaking, $6 for a 16 page pdf with little art is relatively expensive when one looks at Knockspell magazine ($4 for 64 pages plus lots of art), and even Fight On! (more expensive). Renneton, capital of cheese? Ouch. I assume it's just down the road from the great jam-making town of Pecton. ...that said, as a fan of Cheddar showcaves and the Witch of Wookey Hole, I'm delighted that cheese caves are finally getting some love. I only hope they managed to resist filling the place with eerie winings and Munsters. Thanks so much for the extremely thoughtful review. If any of your readers are, like you, a bit concerned about the price, we might as well let them know about an upcoming sale. Later this week, as part of RPGNow's GM's Day Sale, all Faster Monkey Games will be 25% off, including WHEEL OF EVIL for only $4.50, and the Handy-Dandy TURNTRACKER for just $2.25! richard, I thought much the same, but then I suppose that we're dealing with a level of society where people and places are likely to be named after their jobs and products. It's where we get names like "Fletcher" after all. Well, now, parsimonious you may be, but I remember shelling out an average of $8 per- for every 1e AD&D module that caught my fancy back in the early 80s. These days I'd say $6.00 is a bargain for any decent product. bighara, ha, well fair enough! That should be Queso-Elemental Plane of Cheese! You know times are tough when Adventures have to fight monsters for a slab of cheddar. I am surprised that the Cheeseheads of Lake Geneva, WI, have not incorporated more cheese in the books and modules. I think that might be because of the uniformity of most WI cheese: you could build dungeons out of it, but you don't get many changes of pace or flavour. I propose a Monster Manual of cheeses: the strong, domineering Roqueforts and Stiltons, the subtle and delicate camemberts and coutances, and the deceptively powerful dolcelatte. I can see a level-based system, with edams and havartis as surface-going foot soldiers propitiating, or desperately trying to contain, the rare and dangerous morbier or taleggio lurking in the depths. I wonder what the final, the boss cheese would be. Something made from dragon milk.